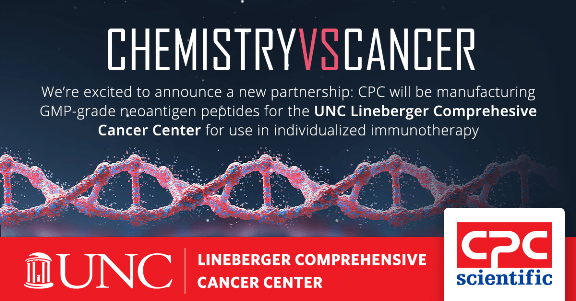 SUNNYVALE, Calif. - Feb. 22, 2019 - PRLog -- CPC Scientific Inc., a leading global CDMO specializing in synthetic peptide manufacturing, announced today that they will manufacture GMP-grade neoantigen peptides for investigators at UNC Lineberger Comprehesive Cancer Center (LCCC) for the purpose of individualized immunotherapy. CPC Scientific will supply GMP-grade neoantigen peptides, the sequences of which will be determined via genomics and bioinformatics, for use in the LCCC therapeutic neoantigen vaccine program. CPC Scientific Inc. will manufacture approximately 10-30 custom peptide sequences for each patient. Vaccines that activate the immune system play a key role in the prevention and treatment of human diseases. The development of cancer vaccines, however, have only been effective in virus-caused cancers such as human papillomavirus-induced cervical cancers. It has long been known that T cells play important roles in recognition and control of tumor cells (2001, Shankaran). Harnessing T-cells to target and kill specific cancer cell types (i.e., immunotherapy) has emerged at the forefront of novel cancer therapeutics. Traditional immunotherapy approaches involving the targeting of existing tumor epitopes has had limited success mainly due to the low T-cell avidity from thymic selection and central tolerance. The limited success of traditional immunotherapies outside of the viral-induced cancer types has created additional opportunities for new therapies to emerge. Rapid manufacturing, quality control, and release. About CPC Scientific CPC Scientific is a globally recognized and leading CDMO specializing in synthetic peptide production. We work directly with leaders in the biotechnology and pharmaceutical industries to help bring life-changing therapeutics and diagnostics to market. We boast the largest GMP peptide facility in the world, which successfully has undergone multiple FDA inspections and audits by global pharma organizations. CPC Scientific has the capability of serving customers from early drug discovery stages through clinical trials to commercial manufacturing. About UNC Lineberger Comprehensive Cancer Center The UNC Lineberger comprehensive Cancer Center, founded in 1975, is one of 40 National Cancer Institute (NCl)-designated comprehensive cancer centers in the country. The Center's mission is to reduce cancer occurrence and death in North Carolina and the nation through research, treatment, training and outreach.